I spend time each week helping at my kids school with reading and writing. The thing that I enjoy most is the way-out answers kids give to some questions – it’s terrific that they use their imaginations with little regard to providing answers that are ‘right’ or ‘wrong’. I’m well aware that somewhere along the track this changes, largely because our education system demands it, but it’s good to have reminders that creativity and individuality are things worth exercising. 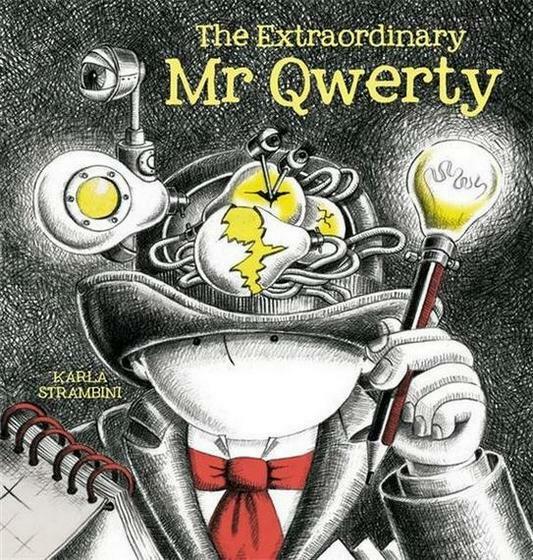 The Extraordinary Mr Qwerty by Karla Strambini is a simple and short story that tackles the theme of individuality. Mr Qwerty worries that his ideas might seem strange and so he keeps them under his hat (and feels a little lonely doing so). But extraordinary ideas refuse to stay hidden for long and soon Mr Qwerty is forced to share – the results are enormous, magical and thrilling. 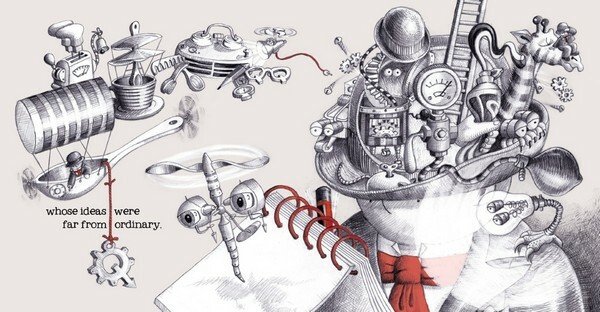 While the story is simple, Strambini’s illustrations are anything but – crammed with incredible detail the black-and-white drawings are studded with symbolic bursts of colour and will fascinate children with a penchant for all things machine-like and inventive. 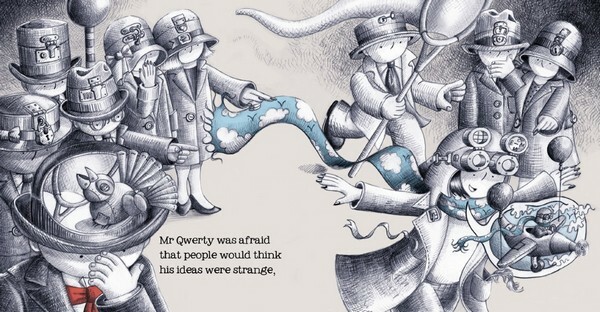 There’s an abundance of hats on nearly every page, used nicely as a visual analogy for people’s minds and imaginations – it’s a clever way of literally showing children how everyone thinks differently. The observant reader will also see stories within the story, played out in the illustrations – the use of colour provides the clues. Although the text is relatively short, this story is most suited to children aged five years and over who will appreciate the detailed illustrations and themes. Find The Extraordinary Mr Qwerty online at Fishpond.